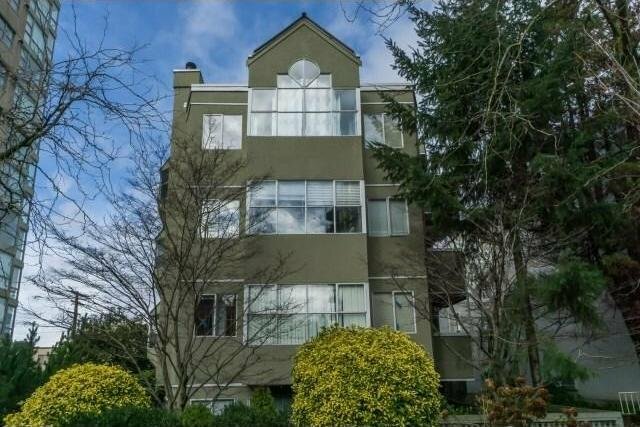 SOUTH GRANVILLE PENTHOUSE! INVESTOR ALERT- RENTALS & PETS ALLOWED! This 2 bed + den unit is located on the quiet side of an exclusive 7-unit boutique building STEPS to South Granville shops, restaurants, Granville island, Kits beach and Douglas park. Partial downtown, water, mountain views from this top floor unit. The interior boasts an open-concept kitchen and living room area, extra solarium/den space, stainless appliances, large closets & bedrooms, in-suite laundry , laminate flooring, wood burning fireplace, vaulted ceilings and skylights which let natural light pour in. Very LOW STRATA FEES, additional parking available for rent!